What is Lymphatic Therapy and who would benefit from it? Lymphatic Therapy with the LYMPHSTAR uses a form of vibrational energy technology with therapy heads that emit a low energy vibration that is safe and relaxing. Lymphatic Therapy with the Lymphstar, improves lymphatic circulation, enhances detoxification of toxins, and increases the process of cellular respiration. Before we discuss who would benefit we need to talk about what the Lymphatic system is and what it does in the body. The Lymphatic System a complex network of lymphoid organs, nodes, ducts, tissues, capillaries and vessels that produce and transport lymph fluid from tissues to the circulatory system. The Lymphatic System is often referred to as “the garbage disposal system”, the “second circulatory system” or the “River of Life”. These names refer to the functions of the Lymphatic System. The lymphatics transport the fluids that cleanse every cell and organ in the body. The Lymphatic system is the pathway for Toxins to exit from the blood and from the spaces between the cells. Our cells are constantly exchanging substances within this space. The Lymphatic System takes up the toxins and eliminates them through the skin, lungs, urinary system and the bowels. The Lymphatics play a key role in our immune function as well. The lymph fluid carries infection fighting white blood cells to help destroy bacteria, viruses and fungi within the nodes. The nodes help to filter out these pathogens and other toxins. When the system is blocked or sluggish a condition of stagnation occurs which promotes fatigue and ill health. Some of the contributors to this stagnation are stress, lack of exercise, poor diet, tight clothing, electronic and chemical pollution, hormone disruptors from plastics, poor sleep, drugs and herbicides/pesticides. Some of the issues that may be a result of poor or stagnant Lymph flow are, sinus troubles, headaches, swelling in any part of the body, tender cystic breasts, fatigue and chronic pain syndromes, skin and other infections, weight gain or weight loss resistance, asthma and allergies, poor digestion, female specific problems, inflammation and prostate issues. 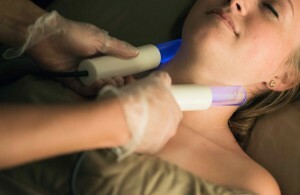 There are also many benefits using the LYMPHSTAR with cosmetic and body sculpting techniques. When Lymphstar Therapy is used following/in conjunction with Ultrasonic cavitation and/or RF skin tightening the results are increased dramatically over using the therapies individually. If you are dealing with lymphatic stagnation or are just curious, please give our office a call to schedule a visit for the LYMPHSTAR Therapy. An average session is about 40-50 minutes long and is very relaxing. During the therapy you will undress as you would for a massage and be on a comfortable massage table.